How a CBI Director is appointed? After the high-power committee ousted Alok Verma as CBI Director, now the committee is set to select the agency’s Director. The CBI draws its legality from the 1946-Delhi Special Police Establishment Act (DSPE). Before the Lokpal Act was legislated, the CBI director was appointed by the DSPE Act. Now, the Lokpal Act governs the appointment of the CBI director. The CBI director is appointed by the Centre on the basis of the recommendation of a search committee comprising of the Prime Minister as the chairperson, the Chief Justice of India and the Leader of Opposition. Above Selection committee was constituted under The Lokpal and Lokayuktas Act, 2013. The process of selecting the CBI director begins in the Home Ministry, which prepares a list of IPS officers, who are eligible for the post on the basis of their seniority and experience in the field of probe. The MHA list goes to the Department of Personnel, which prepares the final list on the basis of “seniority, integrity and experience in the investigation of ant-corruption cases”. The search committee examines the names and sends its recommendation to the government for the appointment of CBI director. Earlier, under the DSPE Act, the CBI director was appointed on the basis of the recommendation by a panel comprising the Central Vigilance Commission as chairperson, other vigilance commissioners, Home Secretary and Secretary (Co-ordination and Public Grievances the Cabinet Secretariat). The Chief Justice of India can nominate a Supreme Court judge if he does not attend the search committee meeting. In the absence of a formal Leader of Opposition in the Lok Sabha, the leader of the floor of the largest opposition party takes part in the search committee meetings. 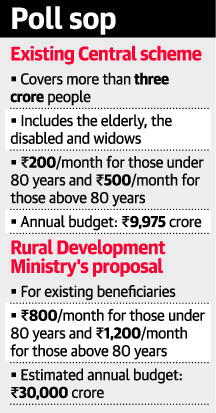 Union Rural Development Ministry has proposed to increase the monthly pensions of the elderly poor, disabled and widows from ₹200 to ₹800. For those above the age of 80, the proposal is to increase the pension from ₹500 to ₹1,200 a month. If implemented, it would lead to additional annual cost implication of ₹18,000 crore to the Finance Ministry. Rural Development Ministry administers the National Social Assistance Programme (NSAP). A study has been launched to consider doubling the number of people covered by the scheme, a promise originally made in last year’s Budget. Discussions are also being held with the State governments on a proposal to merge the Central and State pension schemes. It represents a significant step towards the fulfillment of the Directive Principles in Article 41 of the Constitution. It is a Centrally Sponsored Scheme. It provides financial assistance to the elderly, widows and persons with disabilities in the form of social pensions. It is a welfare programme being administered by the Ministry of Rural Development. However, this programme is being implemented in rural areas as well as urban areas. NSAP at present, comprises of Indira Gandhi National Old Age Pension Scheme (IGNOAPS), Indira Gandhi National Widow Pension Scheme (IGNWPS), Indira Gandhi National Disability Pension Scheme (IGNDPS), National Family Benefit Scheme (NFBS) and Annapurna. Indian firms are importing plastic scraps from China, Italy, Japan and Malawi for recycling. To incentivise domestic plastic recycling units, the government had banned the import of plastic waste, particularly PET bottles in 2015. In 2016, an amendment allowed such imports as long as they were carried out by agencies situated in Special Economic Zones. It’s this loophole that’s been exploited. A lack of an efficient waste segregation system and inadequate collection is the root cause for this wide gap. Bihar and Andhra Pradesh led the pack among States in terms of GDP growth in financial year 2017-18. Bihar registered 11.3% and Andhra Pradesh registered 11.2% growth, compared with the national GDP growth of 6.7% for the year. 12 of the 17 general category States grew faster than the national growth rate. However, the report noted that this growth was not equitable, with the gap between the per capita incomes in low-income and high-income States widening over the last five years. Jharkhand, Kerala, and Punjab are at the bottom. China’s economy shows growing signs of weakness. Its growth slows to 28-year low. China to roll out more stimulus to avert a sharper slowdown. Slowdown has fuelled anxiety about global risks. 19 amphibian species are being treated as critically endangered and 33 species as endangered. The list prepared by ZSI notes whether the species are in danger, according to the International Union for Conservation of Nature (IUCN). In 2009, the total number of species listed was 284. In 2010 it was 311, in 2011 it was 314, in 2012 and 2013 it was 342, in 2015 it was 384 and in 2017 it was 405 species. The current list bears the names of 432 amphibian species from India, the year of discovery and their IUCN ‘red list’ conservation status. Among the amphibians listed, 19 species are treated as critically endangered and 33 species as endangered. The list describes 19% of amphibians as data deficient species and 39% as not assessed by the IUCN. Therefore, it is high time that IUCN status for the Indian ‘not assessed’ amphibians (169 species) are assessed. Rajasthan tribal meet stresses on preserving indigenous practices. It laid emphasis on re-establishing their links with the livestock, local herbs, traditional foodgrain and indigenous agricultural practices as a safeguard for protecting their culture. Subjects of agriculture and health care discussed. The tribal farmers took a pledge to preserve the fertile soil in their areas for ensuring food security. 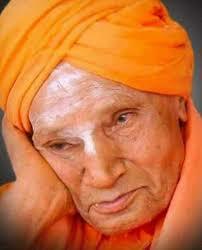 Shivakumara Swami, the 111-year-old seer of Siddaganga Mutt, Karnataka passed away. He was popularly known as “Nadedaduva Devaru” (Walking God). The Lingayat seer was known for his humanitarian work in education. A Padma Bhushan awardee, the seer founded over 125 institutions and was a follower of the Virakta Lingayat tradition. He had followers across caste and religious barriers. He became a seer of the mutt in 1941, had a long stint of 78 years. Since the 1991 economic reforms, India has improved tremendously in almost all economic indicators, and is now one of the fastest growing nations in the world. Various economic policies of the current government have enabled the economy to move faster than ever before. These include tax reforms leading to the introduction of the Goods and Services Tax, reforms making India more competitive in the ‘Ease of Doing Business’ index, and implementation of the Insolvency and Bankruptcy Code. But it has never been more important to also strengthen the quality of the material which makes up the engine of the economy, i.e. India’s institutions. As a democracy, India has an advantage: the roots of all its institutions are strong. The judicial system, in particular, is far from reaching the pace required for efficient functioning. contract enforcement in a time-bound manner powered by an effective judiciary. In a market economy, the government has little role to play in transactions among players. However, it plays an effective role by setting up efficient dispute settlement mechanisms, so that the costs of transactions are minimal. In such an economy, the judiciary plays the pivotal role by enforcing contracts in the case of disputes through minimal costs. Over the years, and with the advent of the Internet, India has taken a leap towards transparency of information. However, little progress has been made in the case of dispute settlement mechanisms due to an inefficient judiciary. Economic Survey of 2017-18 had also pitched for the need for ‘Timely Justice’. Poor working capacity of Supreme Court and High Courts; Huge numbers of pending cases; Poor GDP expenditure on administration of justice are some of the major issues. The focus on the judiciary should increase for better. If the official dispute settlement mechanism does not deliver justice in a time-bound manner, the market players try to bypass the system by paying rents to government officials, a system that became customary in the License Raj. Strong institutions are the key to move India up the economic ladder. Otherwise, India will remain a land of crony capitalists. Critically analyse the reasons behind justice delivery being delayed in India and the associated effects on a market economy like India. The judicial system has simply failed to grow with the growing population and with increasing demands. Do you agree? What can be the practical solutions to this problem? Discuss. The below article provides the definition of “middle class” and the current government’s policies or measures taken towards them. Some critics have raised questions whether the government is doing enough for the middle class. A formal definition of the term “Middle Class” does not exist, though some efforts to provide an outline have been made. One view considers individuals earning US $2 to $13 a day (i.e. an income of roughly Rs 50,000 to Rs 3.2 lakh per annum) as middle class. Another view takes into account consumption pattern to identify middle class. As per this, individuals/families who own basic lifestyle goods such as a fridge, two-wheeler, colour television, etc. can be called middle class. A middle class family can therefore be envisioned as one where one or more members is gainfully employed and they may own some basic lifestyle goods such as those stated above. Further, it is reasonable to consider that this class is liable to pay income taxes (that is, earns at least Rs 2.5 lakh per annum). Has government failed to target this middle class? Considering the above definition, one can notice that the Union government has rolled out a clear development strategy targeting the middle class. Government’s strategy has three broad components. The first involves implementing measures that put more money into the pockets of the middle class, helping them save more. The second relates to creating an environment that reduces their day-to-day hassles and stresses, thus simplifying their daily lives. And the last pertains to empowering them and creating suitable development opportunities. Inflation brought down: The government has deftly brought down double-digit inflation (that persisted before May 2014) to around 3-5 per cent. This has reduced the day-to-day expenses incurred by the middle class, but has also reduced interest amounts paid by them for various loans. Low interest rates: Cost of most loans such as home loans, auto loans, education loans is less compared to that before May 2014.
tax exemption limit was increased from Rs 2 lakh to Rs 2.5 lakh and from Rs 2.5 lakh to Rs 3 lakhs for senior citizens. reduction in tax rate (from 10 per cent to 5 per cent) for individuals earning less than Rs 5 lakh per annum. Together, all these measures increased savings for the middle class to a substantial extent. Physical connectivity: On a daily basis, a majority of the middle class ends up spending hours on personal/office-related commute. To reduce this daily stress, faster and more comfortable transit modes such as metros are being provided. Besides intra-city/town connectivity, inter-city/town connectivity is also being augmented by expanding roads and highways, railways, aviation and waterway networks. General services: Government has taken measures to offer public services in a simple and cost-efficient manner. Today, it is considerably easier and faster to get a passport made or to get income tax issues resolved. Senior citizens can submit life certifications digitally. Impart necessary technical skills to youth. Capacities of higher educational institutes have been increased considerably. Today’s middle class is aspirational. It is financially prudent but at the same time willing to take risks. What it needs is an enabling ecosystem to realise its full potential. The current government has attempted to do this through its various initiatives. Define the term “middle-class”. Discuss the recent measures taken by the government which has enabled conducive ecosystem to realise its full potential. Q.1) Which of the following is/are related to CBI? Q.2) The Central Bureau of investigation (CBI) was established by the resolution of Ministry of Home Affairs in 1963. Which of the following statements regarding CBI are correct? It is a statutory body. It derives its powers from Delhi Special Police Establishment Act, 1946. It is an independent body and does not come under government’s control. CBI director is appointed by the Centre. CBI director is appointed on the basis of the recommendation by a panel comprising the Central Vigilance Commission as chairperson, other vigilance commissioners, Home Secretary and Secretary. Lokpal Act governs the appointment of the CBI director. Q.4) The National Social Assistance Programme (NSAP) is a social security programme comprised of different sub-schemes targeted at different deprives sections of population. Which of the following schemes come under NSAP? Q.5) The National Social Assistance Programme (NSAP) is a social security programme comprised of different sub-schemes targeted at different deprives sections of population. Which of the following statements are correct regarding NSAP? The scheme is administered by Ministry of Rural Development. The program is being implemented in rural as well as urban areas. For getting benefits under NSAP the applicant must belong to a Below Poverty Line (BPL) family.